​The original design of the chancel area contained multiple impediments to the enjoyment and full participation in the worship experience. Through a series of interior design solutions we were able to eliminate these impediments. 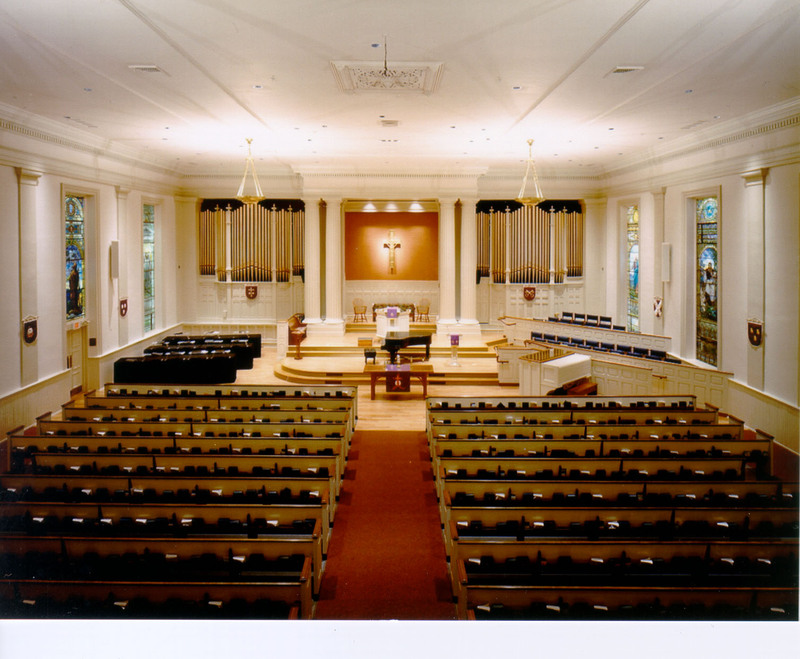 We changed the seating and angle of the choir so it faced the congregation, provided updated sound and lighting systems, chose a flexible seating approach in the chancel area, and modified the access to the chancel area so people at all levels of ability or disability could participate. We also chose a more cheerful color scheme, and wrote specifications for badly needed cleaning and repairs of the irreplaceable Tiffany stained glass windows. A new contemporary worship space replaced the old fellowship hall. It includes a state-of-the-art theater-style audiovisual system that's controlled by a sound booth located on an elevated platform in the rear. Instruments can be left in place on the platform behind a curtain if the room is used for other purposes. Individual chairs allow the seating to be arranged for any venue and anticipated attendance size. Chairs not in use can be stacked for easy storage. The carpet design of Inlaid Chartres Cathedral Labyrinth brings traditional worship icons together with the contemporary functionality. The redesigned small chapel is more versatile due to the change from fixed pews to chairs that can be arranged for the capacity needed for different functions. Unneeded chairs compactly stack out of sight at the back of the room or in a storage area. The color scheme is in soothing tones that become warmer or cooler depending on the amount of light controlled by the new adjustable lighting system. The front wall design compliments the historic detailing found in other areas of the church. 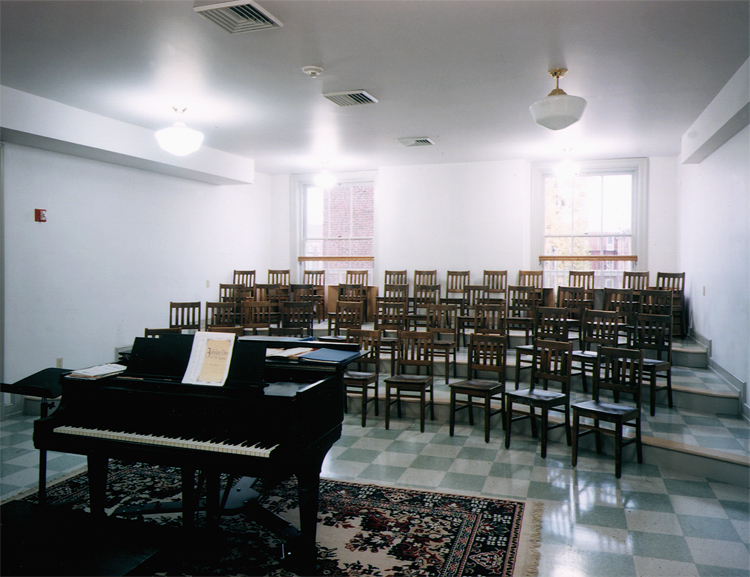 The new choir room is designed with hard surfaces in tiered layers that make it possible for musicians to both see and hear the music director for maximum participation and performance. Window wells, chair curbs, and safety rails are worked into the design of the room in a way that is subtle yet complimentary to the space. The new interior staircase is an open, sweeping focal point at three levels, turning a utilitarian area into an integrated architectural feature. 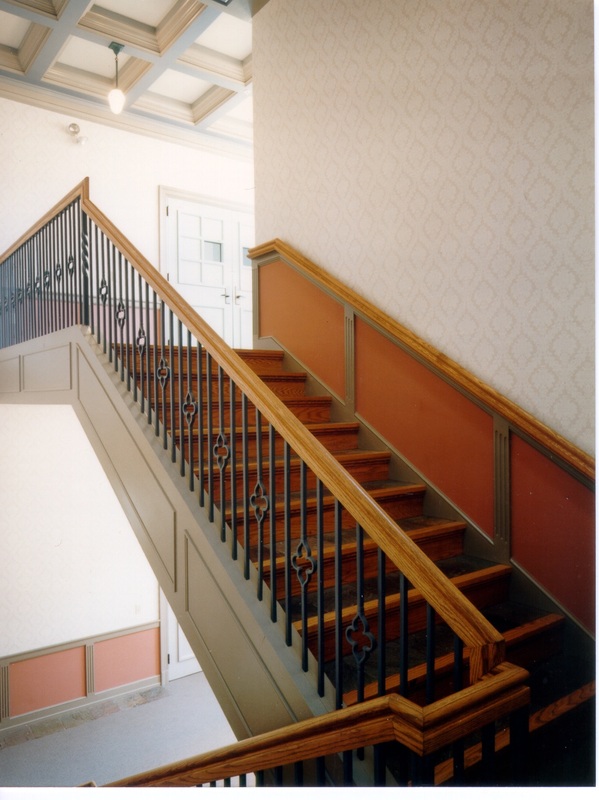 Historic references are seen in the details of the stairs, which were constructed from all stock materials. The new stairs make it faster and easier to travel within the building.